If you have acne-prone and dry skin, honey is what you need (though it works great for all skin types). It’s is one of nature’s perfect foods, and has been used for medicinally for centuries for healing wounds, killing bacteria, and moisturizing skin. Antibacterial: Honey has a crazy long shelf-life: we’re talking millennia-long (it’s been found, still intact, in ancient Egyptian tombs). Its preservation power comes from an enzyme found in the stomach of bees called glucose oxidase. When mixed with the nectar the bees expel (yes, honey is made from bee puke), two byproducts result: gluconic acid and hydrogen peroxide. These, in tern, are responsible for honey's acidity and its ability to suppress bacterial growth. On the skin, this means that honey can help banish acne-causing bacteria by making your skin a less hospitable host. 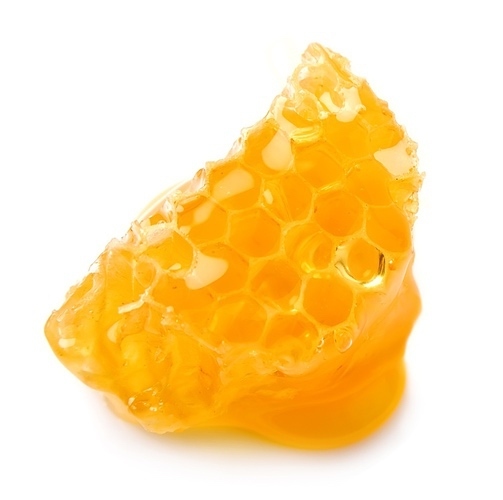 Moisturizer: Another reason nothing grows on honey is the lack of water—it basically smothers nasty microbes to death. This also means it’s incredibly hydrophilic—it really, really wants to bring water in, and can help hydrate your skin. Most conventional acne medications are great at killing bacteria, but they kill everything else in the process and leave your skin parched, flaky, and irritated. This means your skin starts overproducing oil to compensate, which means, you guessed it, more bacteria can grow. Honey will help halt this vicious cycle by keeping your skin moisturized while balancing its acid mantle. That means you have skin that looks great and stays that way. Wound Healing: Honey is a proven wound-healer, and can regenerate damaged cells faster than conventional treatments; it even works where other treatments have failed. One study found that it healed wounds and ulcers in 58 out of 59 people whose wounds couldn’t be healed conventionally. Preliminary studies suggest the mechanisms for this may derive from the hydrogen peroxide and methylglyoxal present in honey. Honey can be used as both a face wash and a mask (just keep it away from water, or its powers literally melt away). Geiling, Natasha. "The Science Behind Honey’s Eternal Shelf Life". Smithsonian. Bang, Lynne M.; Buntting, Catherine; Molan, Peter (1 April 2003). "The effect of dilution on the rate of hydrogen peroxide production in honey and its implications for wound healing". Journal of Alternative and Complementary Medicine. 9 (2): 267–273. PMID 12804080. doi:10.1089/10755530360623383. Majtan, Juraj; Klaudiny, Jaroslav; Bohova, Jana; Kohutova, Lenka; Dzurova, Maria; Sediva, Maria; Bartosova, Maria; Majtan, Viktor (1 June 2012). "Methylglyoxal-induced modifications of significant honeybee proteinous components in manuka honey: Possible therapeutic implications". Fitoterapia. 83 (4): 671–677. PMID 22366273. doi:10.1016/j.fitote.2012.02.002.